I never really paid much attention to the curves and angles on our dining room chairs or wondered why, or more importantly, how they were built that way. Building these chairs has given me a new appreciation for the subtle functional details that go into designing a comfortable chair as well as one that is visually appealing. The angles were the main challenge with the legs and seat rails while the back of the chair is a confluence of curves and arches. Once again, the instructional write-up brushes past most of the details regarding how to make the crest and back rails. However, it did mention that the sequence was to make the offset tenons, cut the inner (concave) curve, make the radial mortises for the splats, cut the upper arch for the crest rail, and lastly cut the outer (convex) curve for the rail backs. I was tempted to change the order but after thinking through the reasoning I quickly came to the realization that this sequence was the least difficult approach. While I was making the mortises for the legs, I also made the offset tenons for both the crest and back rails so I could check the fit and adjust things if required. The crest and back rails started out as 2” x 3” x 15-1/2” blanks. After laying out the 3/8” x 2” X 7/8” tenons I used the bandsaw to cut away most of the waste, leaving 1/8” of material around the tenons to be removed using the FMT Pro. All of the tenons fit tightly in the mortises. Using 1/2” fiber board, cut a base piece that is 4” wider and 4” longer than the overall length of the piece (including tenons). The extra width and length are where the clamp rail and end stops will be screwed into the base piece to hold the piece securely in the jig.. Working from the center of the base piece, lay out the height and length dimensions, including the tenon. Also add a center line mark as well as mark for the height of the arch, in this case 7/8”. 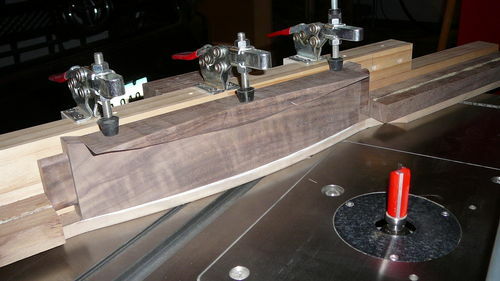 The arch is 14” long and the overall length of the piece is 16” (1” tenons). It is important that the center line be centered on the base piece so the tension is the same on both sides of the ruler as it bends. Pound a finish nail into the intersection of the center mark and the arch height mark. Make sure it is deep enough that it won’t bend or pull out. Clamp a thick piece of scrap on either end of the base piece, snug but with enough play that you can push the base piece away from the edge of the bench. The scrap needs to be thicker than the flexible piece of wood or ruler. Line up the nail and the bottom edges of the scrap pieces and slide a flexible piece of wood, or in my case, a thin metal ruler, along the lower edge of the scrap piece, then on the upper side of the nail, the lower edge of the other scrap piece. 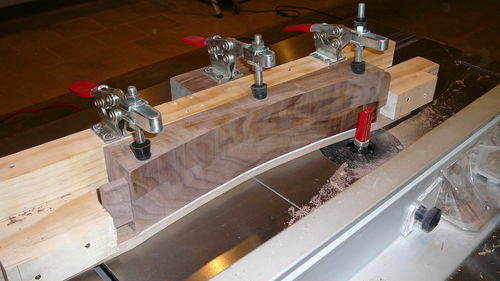 Slide the base piece away from the edge of the bench. 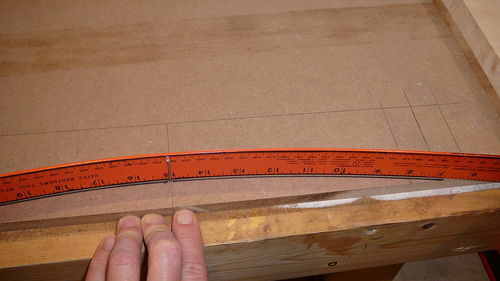 The ruler should bend evenly on both sides providing a smooth, even curve. 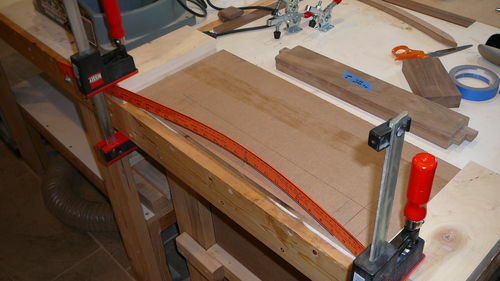 Verify the bottom side of the ruler matches with the edge line and mark the curve. I use a Sharpie since it is the same width as the finish nail. After cutting the curve on the bandsaw and cleaning it up on the spindle sander, screw the clamp rail onto the base piece. Also screw the end stops into place. 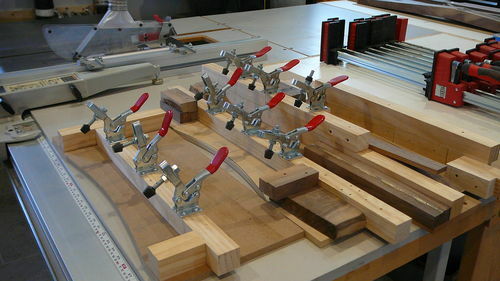 Screw the clamps onto the clamp rail and adjust them so the piece is securely held in place. I made 4 different arch/curve jigs: inside and outside curves for the crest and back rails, a 14” arch for the crest rail top and the seat rail back that also doubled as the template for the 14-1/4” seat side rail arches after moving the stops a bit, and finally, a 16” arch for the front seat rail. I ran out of clamps, more are on the way. You can never have too many clamps!!! 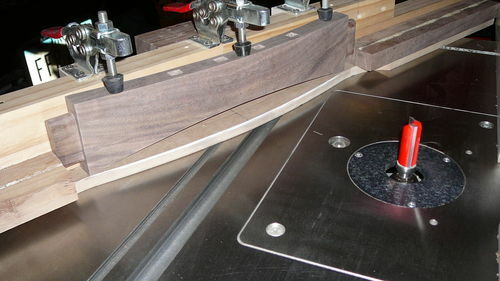 Once the jigs were finished, the curves and arches were marked, rough cut on the bandsaw, then cleaned up on the router. The template bit wasn’t tall enough to handle the pieces in one cut so I made the first pass, then flipped the piece end for end and made the second pass. Generally, I use this approach for making sure the curves are symmetrical. Sounds really difficult but in truth they were not terribly difficult to make. All of the mortises were laid out using a couple of squares. 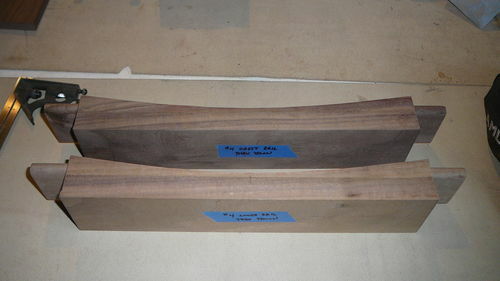 The sides of the mortise were measured from the end of the curve and a mark was made on the concave edge of the piece. I used a small square to mark the top, bottom, and sides of the mortises by flipping the beam to the outside and moving the square along the curve. Consistent alignment was critical to get the mortises oriented the same on each piece. 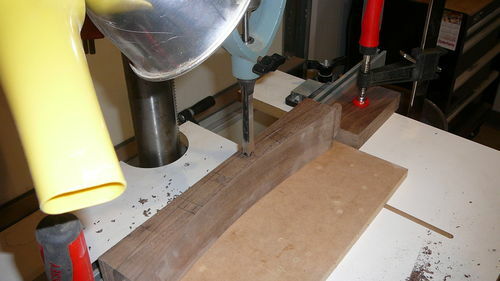 The drill press mortiser was the best option to cut the mortises. Each mortise required a slightly different fence angle. More template router work and spindle sanding to make the arches for all of the pieces. There are a total of 5 arches on each chair. When the dust settled the final product looked pretty good with uniform curves and arches. To avoid confusion, the second piece is the rear seat rail. Hopefully I covered everything and managed to get it in some semblance of the order things were done in the shop. The splats are on the agenda for the next episode. Good stuff, Earl. One question—how did you do the radial mortise variation? Just eyeballing it? I love your tutorials earl very well detailed.im taking a lot of info and using it on the rocker I’m building.thanks for taking the time I know it is well appreciated by many here. Chuck – I sanded several of the mortise marks off because they didn’t look right until I realized everything had to be identical with the way I did the layout. I switched to a 4” square from my normal 12” combo square and kept the beam (the piece perpendicular to the blade) oriented to the outside. 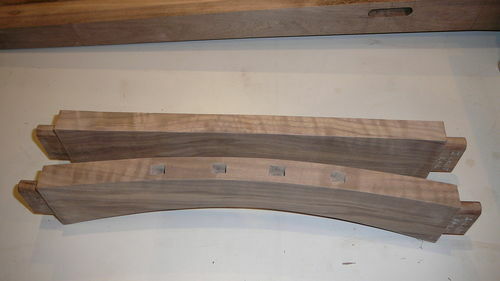 The layouts for the mortises looked reasonably parallel to the inside curve. From there, I also aligned the fence and mortise chisel by eye. Since the mortises were 3/8” x 1/2” they were small enough that slight discrepancies in the alignment didn’t show up when the tenons were inserted in the mortises. I noticed that TungOil has larger mortises in his G&G crest rails and he had templates made at a CNC shop. He might have used CAD to draw the plans for the templates. Grampa Doodie made a really good series on building these chairs. He suggested make a template that included the mortises as well. I suppose there probably are any number of ways to more precisely come up with the layouts using trigonometry but I thought I’d stick with eyeballing it. Looking good Earl! You are making great progress. I did draw all of my templates in AutoCAD. My CNC guys are able to take a .dxf file and convert it directly to machine code, which helps keep the cost down for me. Carefully done I think the mortising templates could be made by hand as well.